1708 Gallery invites US-based and international artists, and curators, to submit proposals for the 2017 and 2018 exhibition seasons. Students with an anticipated graduation date of May 2016 are eligible to apply for exhibitions in 2017, and graduates in May 2017 for exhibitions in 2018. 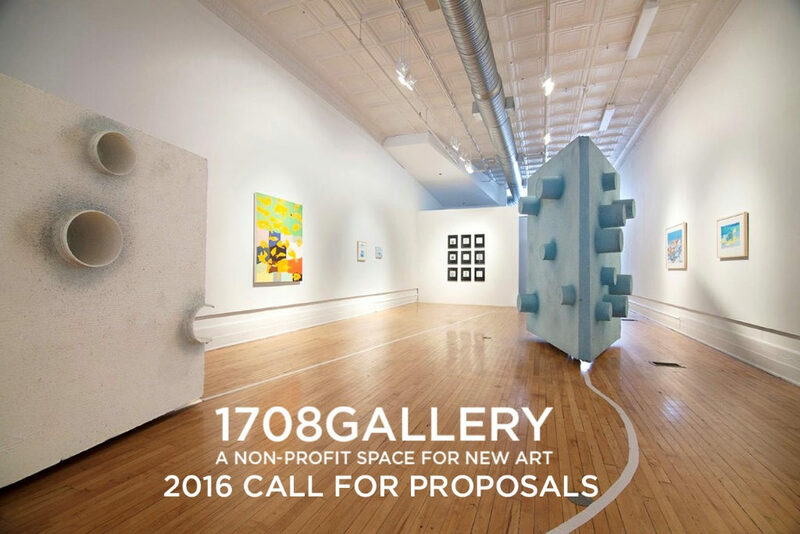 1708 Gallery strongly encourages proposals for developing projects and bodies of work. In addition to proposals for exhibitions in the 1708 Gallery space, public works and other non-gallery based projects will be considered. Selected proposals will be given an exhibition period of approximately six weeks, a $1000 honorarium, and shipping, travel, installation and exhibition support. 1708 Gallery is committed to providing opportunity and space for experimentation, freedom and artistic growth, while promoting understanding and appreciation of contemporary art. We also support artists’ professional development through creation and facilitation of public or educational programming; interaction with collectors; and engagement with diverse audiences. The deadline for submissions is 11:59 PM EST on Tuesday, May 31, 2016. For more information and to submit a proposal, click here.